Aren’t they cute? I couldn’t resist the moment I saw them posted. These are Skechers Cali “Surfer Girl” (Style 36893). I initially ordered a pair in Clear, but exchanged them for Smoke. (The white insoles in the Clear variation really bothered me, so I knew I had to send them back lest I never wear them.) They are also available in Pink and Blue, although last time I looked, the Blue was sold out. Oh, and I see they’re currently on sale! 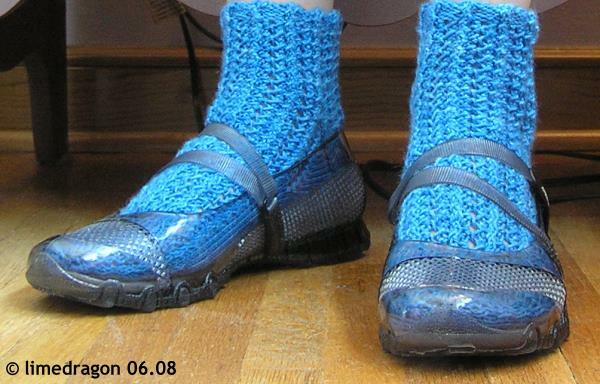 The socks are a new design I did exclusively for Roxanne of Zen Yarn Garden. I’m really excited about them. 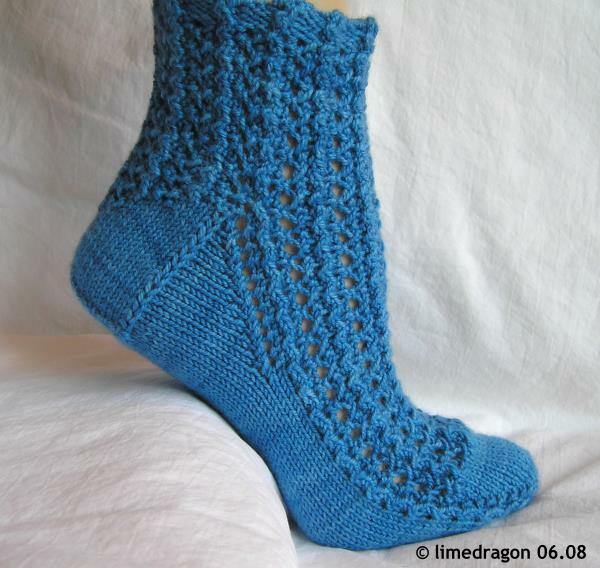 The yarn is lovely to work with, and it was a fun challenge to create a short, lacy sock design that worked well with the sport-weight yarn. Thanks Roxanne for the opportunity, and to Jessica for test-knitting! 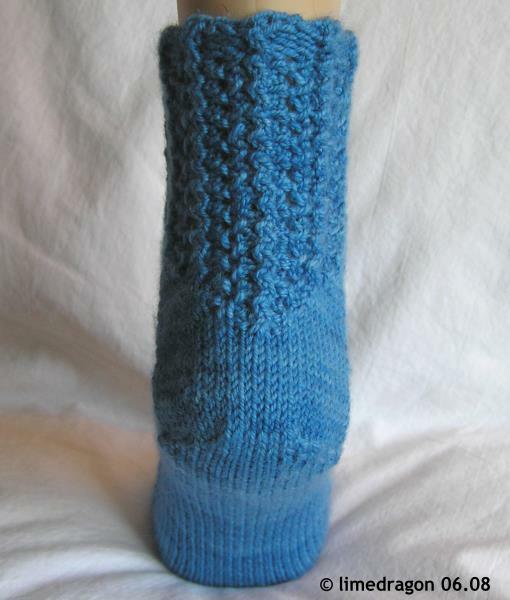 :) Ravel it PS to SOS08 participants: these socks fit the minimum leg/cuff length to qualify. That is a gorgeous sock! Congrats. :) Cute shoes, too. Are they hot? I have some clear clogs that are horrible. Those socks are so cute! The shoes…. interesting. Not sure I could hack them for myself. I have those shoes — in Smoke! But haven’t worn them yet; it’s too hot for socks most days. Damn – I have a credit at shoebuy too! Those socks are adorable. I’m over to “Rav” them now. I just verbed a word! The shoes look great. Are they comfortable? I have a very similar pair of New Balance shoes (in canvas) – I love them, but NB does a wide shoe that I need. The sock is gorgeous. I noticed it right away over on RAvelry. oh! So tempting! I’m just afraid they would make my feet…uh…sweat? But I love the idea! Those are terrific socks. And cool shoes! Yes, I love the shoes, but the socks are magnificent! Yet another great pair to add to my monster queue. Gorgeous photos as well. Do you use a foot mannequin? Okay, you inspired me. I just ordered those shoes in the Smoke color. Only $10.50 with the discount! Can’t wait to get them. howd u get that discount Pam?? ?